What made me kill and kill again? I can’t answer that except like this… Culled from interviews with the lead investigator and the victims’ families, and exclusive access to the killer, this is a revealing, shocking, and unflinching portrait of Gerald Eugene Stano, a man who fancied himself one of the greatest lady-killers of them all. I haven’t finished this book yet, I am reading the killer’s letters to the author, so I felt I have finished enough to write a review. This book is very detailed, the author interviewed the investigators, families of the victims and the killer. The crimes are rather repetitious, the killer would get a girl in his car, then stab or punch, sometimes he would strangle. He also carried a gun and if a girl would run he would shoot her. He showed no emotion or remorse. He claimed to not have a motive other than the girl would get, ‘bitchy and mouthy’. I gave this book 4 stars, but it is probably more of a 3.5 star book. 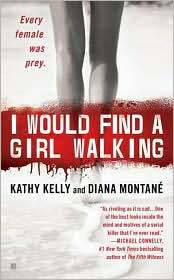 Posted by Belleza on September 25, 2011 in 2011, Non-Fiction, True Crime and tagged 3.5 Stars, Abduction, Diana Montane, eBooks, Kathy Kelly, Murder, postaday2011, Recommended to read, Serial Killers.